Alafair S. Burke (born October 1969) is an American crime novelist, professor of law, and legal commentator. She is the New York Times bestselling author of two series of crime novels—one featuring NYPD Detective Ellie Hatcher; the other, Portland, Oregon, prosecutor Samantha Kincaid. Her books have been translated into more than a dozen languages. Burke was born in Fort Lauderdale, Florida, and raised primarily in Wichita, Kansas, where her mother, Pearl Pai Chu, was a school librarian and her father, fellow crime novelist James Lee Burke, was a professor of English. She traces her fascination with crime to the hunt for the serial killer known as BTK, who was active in Wichita during the 1970s. Burke received her Bachelor of Arts in Psychology from Reed College, in Portland, Oregon, completing the Senior Thesis "Emotion's effects on memory: spatial narrowing of attention". She went on to Stanford Law School in California, graduating as a member of Order of the Coif. 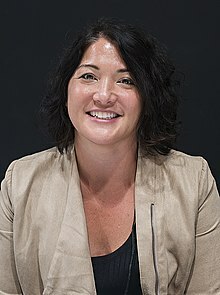 After law school, she served as a judicial clerk to Betty Binns Fletcher of the United States Court of Appeals for the Ninth Circuit and then as a Multnomah County Deputy District Attorney in Portland, where she prosecuted domestic violence offenses and served as an in-precinct advisor to the police department. She currently lives in New York City and is a Professor of Law at Hofstra University School of Law. She has served on the Board of Directors of the Mystery Writers of America and as President of its New York chapter. In 2017, she was elected as a member of the American Law Institute. In 2014, publisher Simon & Schuster announced that Mary Higgins Clark and Burke were collaborating on the Under Suspicion series, featuring an intrepid television journalist who reinvestigates cold cases. In 2017, Burke was nominated for an Edgar Award for Best Novel for her book, The Ex. Burke's novels are known for their authenticity and often draw on real-world cases and the author's personal and professional experiences. Burke's Samantha Kincaid series is set in the Multnomah County District Attorney's Office, where Burke worked in the 1990s. In creating NYPD Detective Ellie Hatcher, Burke drew on her experience growing up in Kansas. Like Burke, Hatcher was raised in Wichita. Hatcher's father was a Wichita police detective who spent his career hunting a serial killer who evaded police for thirty years. Burke's first novel, Judgment Calls, is loosely based on the case of Keith Hunter Jesperson, a serial killer known as the "Happy Face Killer" for the smiley faces he drew on his many letters to the media. Angel's Tip was loosely based on the murders of Imette St. Guillen and Jennifer Moore. In Dead Connection, Ellie Hatcher tracks a serial killer who uses an online dating service to locate his victims. Burke has said that the plot was inspired by her worst nightmares while briefly enrolled on Match.com. Burke subsequently dedicated the book to her husband, writing, "For Sean, I can't believe I found you on a computer." Burke is the daughter of famed fellow crime novelist James Lee Burke. She currently lives in New York City and is married. Remembering Emotional Events, 20 MEMORY & COGNITION 277 (1992) (with co-authors F. Heuer & D. Reisberg). ^ William Plummer. "Sober Perspective: Author James Lee Burke Savors Success Cautiously". People.com. This page was last edited on 20 January 2019, at 03:16 (UTC).